Moorestown Business Association initiated its Spotlight Award Program to applaud member businesses that enhance the township and contribute to the community. Manhattan Bagel meets and exceeds that criteria. From the day it opened its doors in Moorestown in August of 2000, the popular franchise drew customers from across the township and beyond and has been a cornerstone of the Lenola section of town. Owner John Gerber worked in the corporate office of Manhattan Bagel when they broke ground for the Moorestown property, and he was on hand to help launch the new business. From the beginning he sensed this was a special location. Gerber’s bagel journey began in 1989 when a friend invited him to participate as a partner in the former Bagel Builders in Moorestown Mall. Ultimately that concept was merged into Manhattan Bagel, where Gerber was district manager for three years. Yearning for more hands-on involvement, he bought his first Manhattan Bagel franchise in Cherry Hill and subsequently the Moorestown restaurant, splitting his time between the two. His initial attraction to Moorestown grew and he enjoyed doing business there so much that six years ago he made the decision to personally manage the Moorestown location full time. Gerber is also on Manhattan Bagel’s Franchise Advisory Committee, consulting with company leadership and providing input and feedback that affect the 30-year-old operation’s 70 franchises. But his passion lies in operating his own business seven days a week, and connecting with customers. “I don’t feel like I’m in the bagel business,” he explains. “I’m in the customer service business, and I truly like being with them every day—that’s the fun part of the job.” Gerber serves over 2,000 people a week and sees 75 percent of the same customers every day. He has been serving some of them for so long that he has watched their kids grow up and come back with their own families. Gerber is not only committed to his customers, but to the community and its many organizations. He routinely gives food to charitable organizations and discounts to many more. He supports local youth athletic teams, church groups, and school clubs, and donates to a variety of township causes, including Project Graduation, the Scott Coffee Rotary 8K Run, the Turkey Trot and the Jack Walsh Wrestling Tournament. He also provides a number of part-time jobs to local youth. “It’s a joy to be a part of this community—and to give back to the place that supports my business so enthusiastically,” he says. Customers flock to Moorestown’s Manhattan Bagel for the friendly culture Gerber instills in his staff and they sincerely appreciate all he does for the community, but the bagels are what draw people across town even if similar products are within closer range. Gerber explains that by focusing primarily on one signature item, and making it exceptional, his bagels are worth the drive. Manhattan Bagel makes all the dough in a central location because the water used in the recipe is a key factor in the flavor. When the frozen dough arrives, John’s team follows a traditional process of proofing, boiling, and baking that gives the bagels the crusty, chewy consistency that his clientele craves. Most people line up for the breakfast bagel sandwiches, which are available during all business hours, but a full lunch menu is offered, including wraps, sweets, and salads for the low-carb contingent. These options have helped make his catering menu a favorite for groups all over the area. Gerber was also on the committee that developed the coffee blend served at Manhattan Bagel, and says his customers swear by it. And so no one is left out, he even has a jar of “Doggie Bagels” on his counter, which have turned into a top seller. “We try to make everyone happy,” Gerber says with a smile. 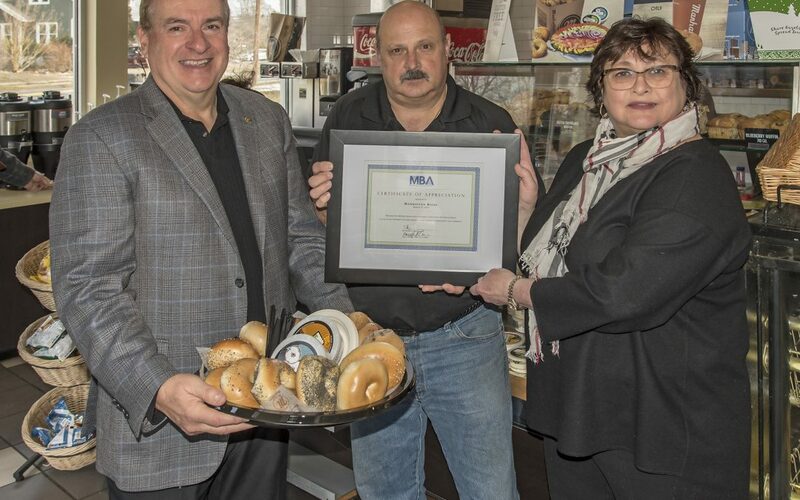 Moorestown Business Association is pleased to recognize John Gerber and Manhattan Bagel with a Spotlight Award for his exemplary business model, the warmth he shares with customers, and continuous service to the community. Photo: MBA President Steven Pazienza, John Gerber, and MBA Vice President Annette McGuire.